Looking for a New Honda Civic Hatchback in your area? CarGurus has 1,103 nationwide Honda Civic Hatchback dealers with 113,724 new car listings. The compact car market is both crowded and competitive. Among entrants, few offer a hatchback, making the 2018 Honda Civic Hatchback a key contender. With the style and sophistication of its coupe and sedan stablemates, the Civic Hatchback adds the versatility of a hatchback. Although hatchback body styles run the risk of looking awkward, the Civic Hatchback looks rakish and sharp. Its swept, angular headlights and bold taillight design make the car look fast—even when it's parked. The Civic features a cabin with ample space and high-quality fit-and-finish. Passengers will find plenty of hip-, shoulder-, leg-, and headroom in both rows. Hatchbacks are all about versatility and economical use of space. To that end, the Civic Hatchback features 25.7 cubic feet of cargo space behind the rear seats and 46.2 cubic feet with the rear seats down. If you opt for the Sport or Sport Touring trims, the space behind the rear seats drops to 22.6 cubic feet, but total cargo space remains the same. Trims for the Civic Hatchback are LX, Sport, EX, EX-L Navi, and Sport Touring. The base LX is well-equipped and includes 16-inch alloy wheels, projector-style halogen headlights, LED brake lights, and a rear-window wiper with heating elements. The LX also comes with Bluetooth hands-free calling and streaming audio, USB input, and a multi-angle reversing camera with guidelines. While not as racy as the Civic Si, the Sport trim adds excitement to the daily commute. Visually, it includes 18-inch alloy wheels, underbody spoiler kit, fog lights, and a unique, center-mounted dual-exhaust outlet. Inside, the Sport adds a backseat center armrest, sport pedals, black interior headliner, leather-wrapped steering wheel, and a leather-wrapped shift knob. The Civic is the more mature option among compact cars, and the EX and EX-L trims embody this. Both cars come standard with 17-inch alloy wheels and heated side mirrors. The EX further upgrades to a one-touch power moonroof, push-button start, dual-zone automatic climate control, an 8-speaker audio system, keyless entry, and a 7-inch HondaLink infotainment display. The “L” in EX-L stands for “Leather,” and it features a leather-trimmed interior. Per its name, the EX-L Navi provides standard navigation, features included with the EX, and adds an automatically dimming rearview mirror and an 8-way power-adjustable driver's seat. The range-topping Sport Touring trim combines the racy look of the Sport with the appointments of the EX-L. It combines the 18-inch alloy wheels, underbody spoiler kit, and center exhaust from the Sport, with LED headlights, a 4-way power front passenger seat, and a 450-watt sound system consisting of 12 speakers and a subwoofer. The EX, EX-L Navi, and Sport Touring trims all come with a 7-inch touchscreen display. It includes the HondaLink suite of apps as well as Apple CarPlay and Android Auto compatibility. The Honda Civic Hatchback comes with a 1.5-liter turbocharged inline 4-cylinder, with varying outputs based on trim. It puts out 174 horsepower in the LX, EX, and EX-L, and it makes 180 hp in the Sport and Sport Touring. Power gets sent to the front wheels through either a 6-speed manual transmission or continuously variable transmission (CVT) that operates like an automatic. On the Sport and Sport Touring, the CVT also has paddle shifters to simulate gear ratios. When equipped with the 1.5-liter turbocharged engine and the CVT transmission, the Honda Civic LX, EX, and EX-L return fuel economy of 31 mpg city, 40 highway, and 34 combined. With the manual transmission those numbers fall to 29, 38, and 33. The Civic Sport with CVT returns fuel economy of 30 mpg city, 36 highway, and 32 combined. The Honda Civic Hatchback comes standard with a full array of front and side impact airbags, traction control, LATCH child-seat anchoring system, a tire pressure monitoring system, and a reversing camera with guidelines. Also available, Honda Sensing is a suite of safety technologies designed to prevent accidents. It includes forward-collision warning, a collision-mitigation braking system, lane-departure warning, road-departure mitigation system, automatic high beams, and adaptive cruise control. 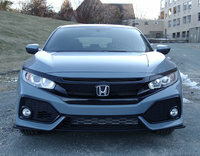 Honda Sensing is standard on the Sport Touring and available on the LX, EX, and EX-L. The EX, EX-L, and Sport Touring all come standard with Honda LaneWatch, an innovative blind-spot monitoring system that's much more than a sensor with an audible beep. The LaneWatch camera is mounted under the passenger side mirror. When drivers click the right turn signal, the camera engages and shows an image of the passenger-side blind spot on the central touchscreen. It not only allows drivers to view any cars in their blind spot, it also provides a great view of the curb for parallel parking in the city. The 2018 Honda Civic Hatchback has a base MSRP of $20,050 for an LX trim with the 6-speed manual. The Sport trim starts at $21,650, while the EX starts at $23,150. The range-topping Sport Touring trim starts at $28,650. There are many compact cars from which to choose, all offering distinct attributes. With more space and maturity, the Civic Hatchback stands out by offering , consumers more features and a higher quality than competitors. 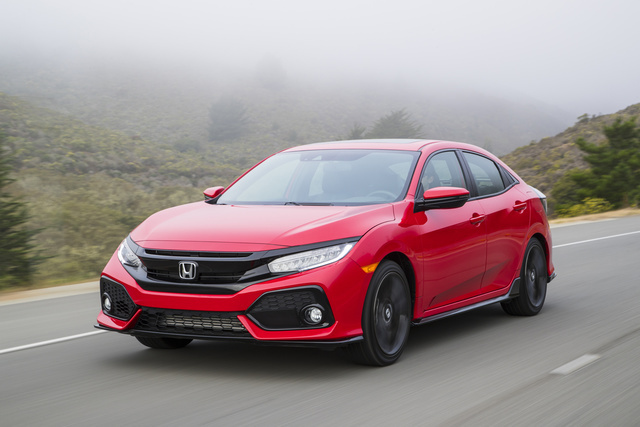 What's your take on the 2018 Honda Civic Hatchback? 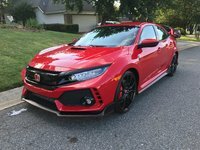 Users ranked 2018 Honda Civic Hatchback against other cars which they drove/owned. Each ranking was based on 9 categories. Here is the summary of top rankings. Have you driven a 2018 Honda Civic Hatchback? Enter your zip to see incentives for a new Civic Hatchback in your area. CarGurus has 20,432 nationwide Civic Hatchback listings starting at $13,500.